pokemon vs yugioh. . Wallpaper and background images in the Эш Кетчум club tagged: ash pokemon vs yugioh funny. This Эш Кетчум fan art contains аниме, комиксы, манга, анимационные фильмы, комикс, мультфильм, and книга комиксов. Yeah thats what I do if Ash Fucks with me! This person read my mind! 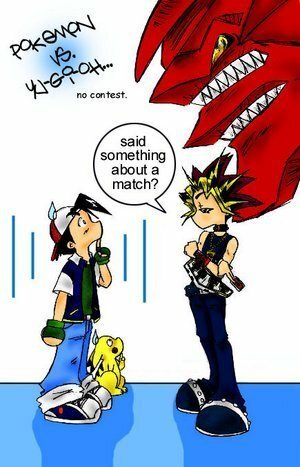 ash is doomed if him and yugi moto battled. DarkShaden wtf are you saying. He got cards in his hand your just blind and besides, pokemon cards hp be like 200 or less versus a 1000 attack and defense monster. Come ON. Ash always wins, no matter what.